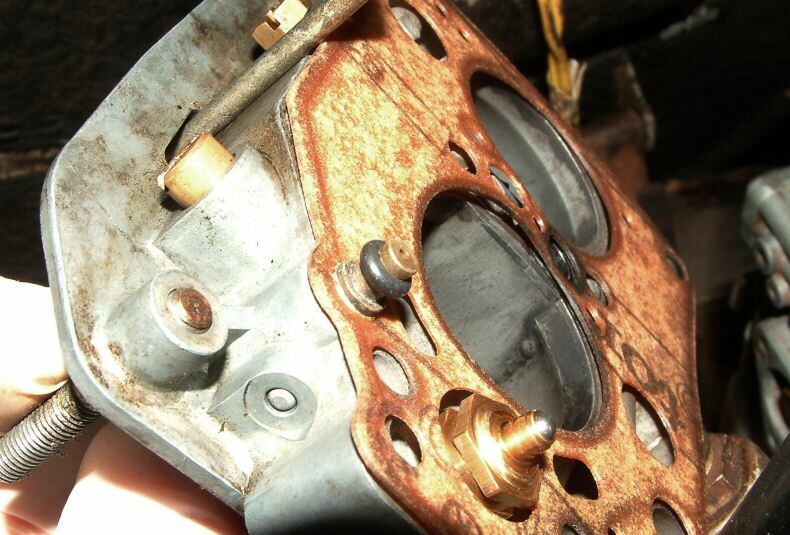 Notes about maintenance of the Solex 34CIC carburettor. A carburettor is a precision piece of equipment which needs to be kept in good order to run well. This page documents my own experience regarding replacement of gaskets and seals on the 34CIC. First a word of caution: The carburettor contains petrol. While liquid petrol does not burn, petrol fumes ignites very easily, and burns violently. If you choose to carry out maintenance with the carburettor still in the car, be very careful not to ignite the petrol that will vaporise from the float chamber. Best is to do it in free air. If you remove the carburettor from the car, and bring it to a workshop table, make sure you dry the float chamber well out into a jar, which you close with a sealing lid. There is a gasket kit available, and a full repair kit too. The former consists of gaskets and seals, float needle valve, and accelerator pump membrane. The gasket kit only consists of the gaskets and seals. The price difference isn't great, but while the gaskets can be replaced with the carburettor in the car, replacing the accelerator pump membrane requires the carburettor to be removed from the car and dried of petrol - otherwise all the petrol in the float chamber will spill out. As the float chamber contains more than 100 ml of fuel, this is not advisable. But, before ordering either of the kits, please note that you will need a different o-ring than the one supplied. The o-ring in the kits simply is of the wrong size! See below under 'parts' for more info. First step is to take the two parts of the carburettor apart. The top is fixed with five screws, and with these removed, it can be carefully lifed off the bottom part. The choke connecting rod will prevent you from taking the two parts completely apart, but can be carefully disconnected from the linkage if you need to. This will reveal the main gasket which is removed revealing the float chamber. At this point it will be wise to check the float height. The picture below shows a correct float height. The height is adjusted by bending the little tab, which pushes against the needle valve, opening it when the float level drops below a certain point. The float level is critical for the emulsion tubes mixing the fuel correctly with air. There is a little o-ring fitted on a spigot sitting in the top of the carburettor - this o-ring has caused a few problems for me so I strongly suggest checking it carefully at this stage as it may have broken or been deformed. This is what happens to an incorrectly sized o-ring seal in the accelerator pump fuel line - and since it is quite clearly damaged, it cannot seal. The effect is fuel leaking out of the carburettor on the side when the accelerator pump is operated. The old gasket sits tight around the emulsion tubes, so it may stick a bit. The new gasket should be fitted carefully at this place. Before fitting the gasket, however, verify that the spigot and o-ring can pass through the gasket. 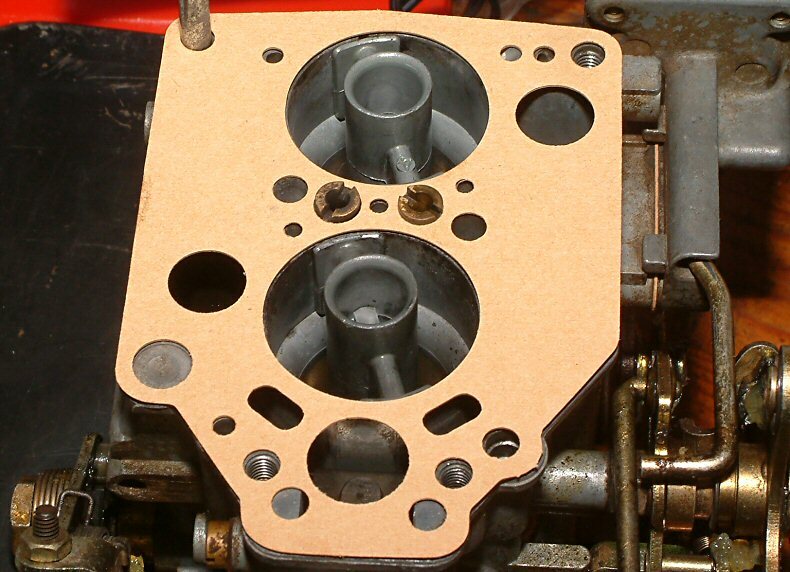 If it cant, then you will need to fit the gasket to the top part of the carburettor, fit the o-ring over the spigot and then put the two halves together. This may need a bit of fiddleing with the gasket around the emulsion tubes, though. The main gasket fitted on the bottom part of the carburettor. Note that this is not the way to fit the gasket - it needs to be fitted on the top part with the accelerator pump seal fitted over the spigot. But the photo shows how it fits. Correct o-ring seal fitted correctly over the main paper gasket. Additionally, you will need a different o-ring for the accelerator pump fuel line. This must fit the 2 mm groove in the spigot and the 5.5 mm matching recess. The o-ring supplied with the kits above are too large and will break. This will cause fuel to leak out on the side of the carburettor when the accelerator pump is operated, as the gasket alone is not able to cope with the pressure at this point.